We have updated our review of the Canon PowerShot G1X premium compact, which allows us to examine how well the camera performs in low light. The camera's low light performance is one of the key areas that Canon is keen to push with the G1X. It features an almost APS-C sized sensor in a 4:3 aspect ratio format, and has the same size pixels as the Canon EOS 600D entry-level DSLR. Notably the G1X has Canon's new Digic 5 processor rather than the EOS 600D's Digic 4 engine. David Parry from Canon UK told us in an exclusive interview, that this compact camera offers DSLR like image quality in a compact body and that Canon classes the G1X as a "new category" of camera. During our lab testing, we have found that Dynamic Range results show that both JPEG and raw images have improved low light performance when compared with the Canon PowerShot G12, the company's other premium compact camera. Tonal detail captured at ISO 6400 and 12800 were found to be especially good for a compact camera, comparing well against other premium compacts and even DSLRs. At the lower end of the sensitivity scale, the Canon EOS 600D does just about edge it, but at sensitivities over ISO 400, the G1X was actually better for both signal to noise ratio and dynamic range. Lower ISOs also show lower noise levels when compared with the G12, even though the difference is less marked. The G1X is capable of capturing a larger tonal range and producing images with less noise. 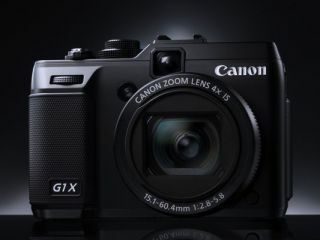 For the full details of our lab testing, as well as in-depth "real-world" testing, see our full Canon G1X review.